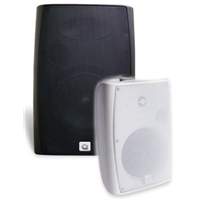 With excellent bass response and a lift in the crossover for greater vocal intelligibility, the MS 801 is ideal for distributed sound reinforcement, paging and background music applications. A 25mm polymer dome tweeter faithfully reproduces upper harmonics and is protected by a sophisticated crossover protection network. Power handling is a conservative 100 watts RMS with high efficiency, 200w peak handling.